I have had a few ideas rattling around in my head for the JustRite Challenge #103 Things with Wings. Late last night I finally had some time to try and put one of the ideas into paper! 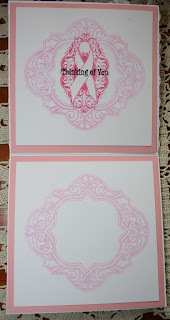 This particular challenge also partners with Spellbinder Dies so I used a multitude of Spellbinder dies on this card! I like Spellbinders because I am able to really mix and match shapes. And if I cut a die shape out and it doesn't work with the card I am making I just put it into a basket with other cut die shapes to use on another card down the road. This way I have a ready and varied stash of cuts in regards to shapes and colors. I decided to go with a "Breast Cancer" themed card as unfortunately, there are always so many people that I can send this card to. I have a sweet little set from JustRite that is all breast cancer themed....and I have used and used and used this set. I only ended up using the sentiment from the Be Strong set this time. I decided to enter this card into Our Creative Corner's Challenge Words, Words, Words as I think that this sentiment says it all! Together we CAN find a cure. 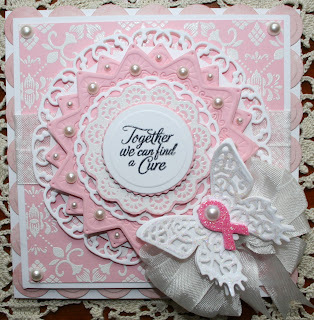 The little white embossed doily is from a JustRite set called Graceful Monogram and the white embossed pink background is a large background stamp called Sweet Lace. When I started this card some of the inking and papers were in a second color of pink...ultimately I decided that was too much going on and so since I didn't want to sacrifice layers I decided to sacrifice color! But all in all I like this card. I am loving that background stamp. This is the first time that I have inked it up and I can say it inked up beautifully and evenly the first time out! And, think about stopping over to the JustRite site.....there is a new challenge every Friday. Also, there is still time to enter JustRite Challenge #103 Things with Wings. So here is my card....Pink Rules! And here is the inside. I see know there is a bit of a smudge....so I will have to have a do over before I send this on. It's amazing what I see thru the camera that I don't always catch in RL! Thank you so much for stopping by and all your kind comments lately. I appreciate each and every one of them. 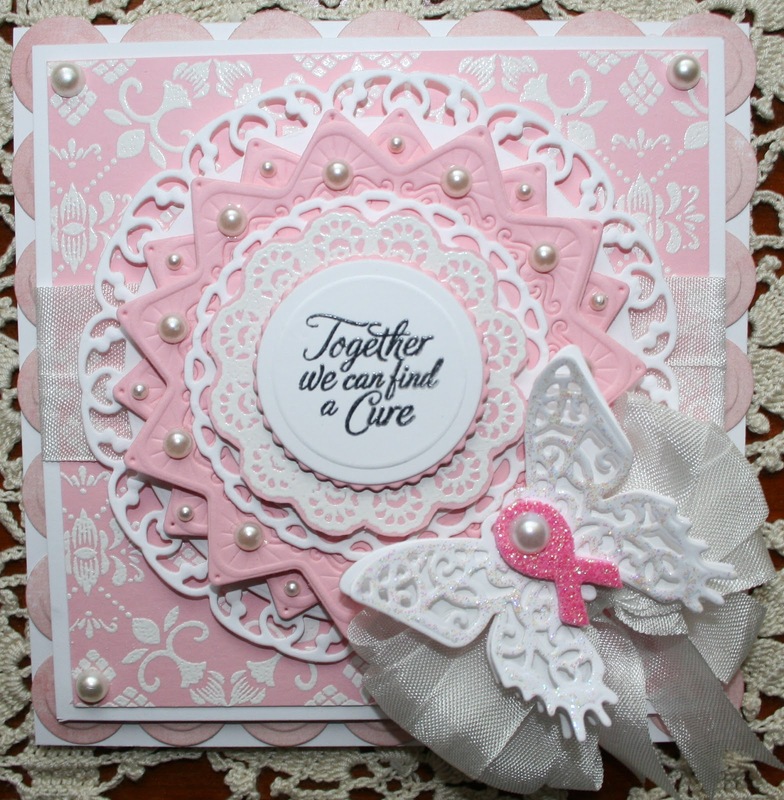 This is one beautiful pink card, Sheila! Love all the layers. Sheila, This is so pretty in pink. Your layering is stunning. Love the dies you used. Your stamping is just perfect. What a beautiful card Sheila! I love all the pretty layers and the beautiful bow. this is just stunning, Shelia! I love that butterfly and all the pink! Now, wait a minute! Did you make up that word, Sheila? Your cards are getting more and more spectacular! This is so rich, with all the yummy layers and that color combo. You do it right, girlfriend. Love this! Sorry to hear that you have a use for a card like this, but I'm sure that receiving this GORGEOUS card will brighten someone's day immensely! The b'ground and the way you layered your dies make this really special! So pretty! I am sure it will brighten someone's day! WOW!! This is a BEAUTIFUL Card!! I LOVE all of the layers and the stamping on the inside is so Pretty!! THANKS for sharing!! Have a FABULOUS WEEK!! stunning Sheila. This is one simply gorgeous card. Love all those intricate doily patterns in the background Sheila. A very soft and beautiful card! 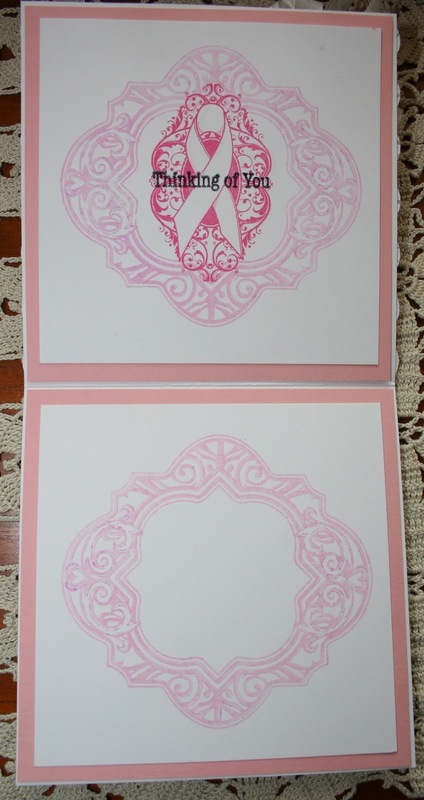 So pretty in pink, with all those delicate die-cuts, and a sweet and thoughtful sentiment. Thanks so much for playing along with us at Our Creative Corner. This is truly beautiful, Sheila! I love every detail including the gorgeous butterfly!